Visiting the Cuban home of literary giant Ernest Hemingway, whose novels and stories I’ve revered is nothing short of a pilgrimage of sorts, and a must for any budding writer. When I think of it, the American novelist feels as much present in Cuba, as he does in his native country. Perhaps even more so. Hemingway’s legacy is evident on the streets of Havana. “My mojito in La Bodeguita, my daiquiri in El Floridita” he famously said, words that put a mark on Cuba and its continuing pull of visitors from around the world. But it wasn’t just rum that lured Hemingway to Cuba. He loved the climate and the options the Gulf Stream offered for fishing. As time passed by and his Key West residence became increasingly crowded and sought after by many, Cuba became his home away from home, his respite to just be, and write. He dedicated his last two decades of his life on living on the Caribbean island, ten miles East of Havana. I made it a task to visit, if only to understand why this serial expat, a bit like myself in a way, chose Cuba as his longest-term residence. Entering through the gates of the now Hemingway Museum, Finca Vigia (which translates into “lookout estate”) comes across as a junction of tropical paradise in the otherwise working-class town of San Francisco de Paula: a fertile little hill brimming with palms and mangoes, tranquil retreats, and an elegant, yet simple one-story ivory-colored house. Set on a hilltop overlooking Havana on the horizon, this was where he wrote the Nobel-prize winning book The Old Man and the Sea, as well as For Whom the Bell Tolls and A Moveable Feast (seven books in total). Unsurprisingly, the novelist drew profuse inspiration from his fishing outings off the coast of Cojimar. No wonder Hemingway stayed on for more than twenty years; it looked and felt perfect for a writer. In an effort to preserve items exactly how he had left them, viewing the house is only allowed from the exterior, peeking through its windows. This definitely makes for one of the more interesting home memorial experiences to be had, whose layout easily permits entering the author’s Universe. The original setting, and mood if you may, is so cleverly preserved, I had the strange feeling as if Hemingway himself was just out for a drive to one of his favorite haunts. The décor speaks by itself: an impressive collection of magazines, a wealth of books (nine thousand to be exact), and an evident passion for hunting dating from his time in Africa. His half-filled liquor bottles remain untouched next to his favorite armchair in the living room, and his glasses, neatly stowed away on a side table. There are news clippings on his bed, and his clothes (and shoes, an astounding amount of boots and shoes for a man) still hanging in the closet. Art is also prevalent, with a plate molded by Picasso gracing the walls of his studio, as well as various omens to Spain and its toreadors. But perhaps most telling was his obsessive note keeping of his weight gain, scribbled on the bathroom wall, which he meticulously scrutinized throughout his later years. Next to the main house is a protruding tower he occasionally wrote from, while down the alleyway a large (now empty) pool awaits. Hemingway often entertained guests here, and he would rarely fail to mention, joke or not, how Ava Gardner had just swam naked in it. Next to it, on the premise of a former tennis court, now rests his beloved fishing boat Pilar. Another peculiarity to the writer’s persona was his love for animals. Dozens of cats are believed to have perused the lawns of Finca Vigia, as well as several dogs. The four dog graves still present in the garden stand as evidence. Through the years of residing here, Hemingway rose to a hero status of sorts that only so few can attest to. To his fellow Cuban neighbors, he was simply “Papa,” a loving moniker indicating his closeness and familiarity to the Cuban people; to the rest of Cuba, he became a legend. 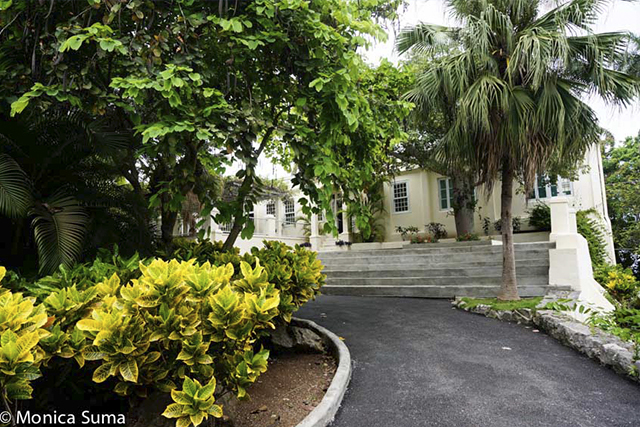 Which in part explains the rare agreement between the U.S. and Cuba starting in 2005 in restoring the 19-century villa, succumbing to neglect following Hemingway’s death in 1961, when his fourth and last wife, Mary, donated the estate to the Cuban people (not before the Castro government allowed her to first take her husband’s documents and artwork collected throughout his life). Under the auspices of the U.S.-based Finca Vigia Foundation, the house and boat have been restored, and even more importantly, some 3,000 original documents (original manuscripts, letters, photographs, hand-written recipes and more) otherwise rotting in the tropical humidity, sorted, cataloged and digitized. Many of these can be seen today at the John F. Kennedy Library and Museum, for the first time outside of Cuba, an initiative that long before the recent diplomatic changes between the neighborhood countries spoke of Hemingway’s undisputed influence to rekindle and unite. Be advised that entry might not be permitted if it rains. Entry fee: 5 CUC.